While serving in the French army, he built his first Arithmometer, which could perform basic addition, subtraction, multiplication, and division. Patented in France by in 1820 (two patents and two patents of addition in between 1849 and 1851). In 1848 Thomas restarts the development of the machine. It was manufactured from 1851 to 1915, it became the first commercially successful mechanical calculator and was still being used up to World War One (1915). Thomas "Arithmometer". Its production debut of 1851 launched the mechanical calculator industry where millions of them were built. It was the first mechanical calculator to gain widespread use, it became a commercial success, till 1915 (World War One). Thomas was made Chevalier of the Legion d’Honor for his invention of the Arithmometer. This is when he changed his name from "Charles Xavier Thomas" to "M. le Chevalier Thomas, de Colmar" and later simply "Thomas de Colmar". By the time of his death in 1870, his manufacturing facility had built around 1,000 Arithmometers since it was commercialization in 1852. At the time, the only reliable and dependable calculator enough to be used in places like government agencies, banks, insurance companies and observatories. 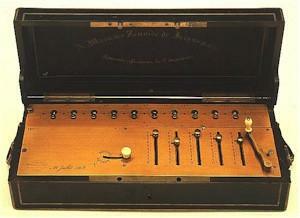 The manufacturing of the Arithmometer went on for another 40 years until around 1914. Why the hiatus of more than thirty years in between 1820 to 1851? Yes, Thomas was busy starting this insurance business and making money to finance his calculator business venture. Charles Xavier did that? I thought he was leader of the X-men.